Isn’t it time that Mill Hill woke up and tried to save itself from being trampled to death? Already the raw, red tentacles of that housing octopus, the London County Council Watling Estate, are pushing their way through the green meadows, devouring everything in their path…LCC wooden bungalows face houses that sold a few years ago for over £2,000. This surely is a scandal. Scandal or not, Mill Hill’s fate had been sealed by the extension of the Northern Line to Edgware in 1924. The LCC acted quickly to purchase 387 acres of farmland adjacent to the new Burnt Oak station. The plans, drawn up by the LCC’s Chief Architect, George Forrest, set aside 46 acres for allotments and parks and 16 acres for schools and public buildings. The rest was for housing. Building began in February 1926. The first family moved in in April 1927; 2100 more followed within twelve months. By 1931, the Estate – 4021 dwellings in total – was complete, aside from 34 larger homes for letting at higher rents added in 1936. Most were traditional brick but the total includes 252 ‘Atholl’ steel and 464 timber-frame homes built as the LCC experimented with methods it hoped would be cheaper and quicker. The timber homes were apparently supplied with 12 feet of rubber hose due to the inadequacy of local fire services. 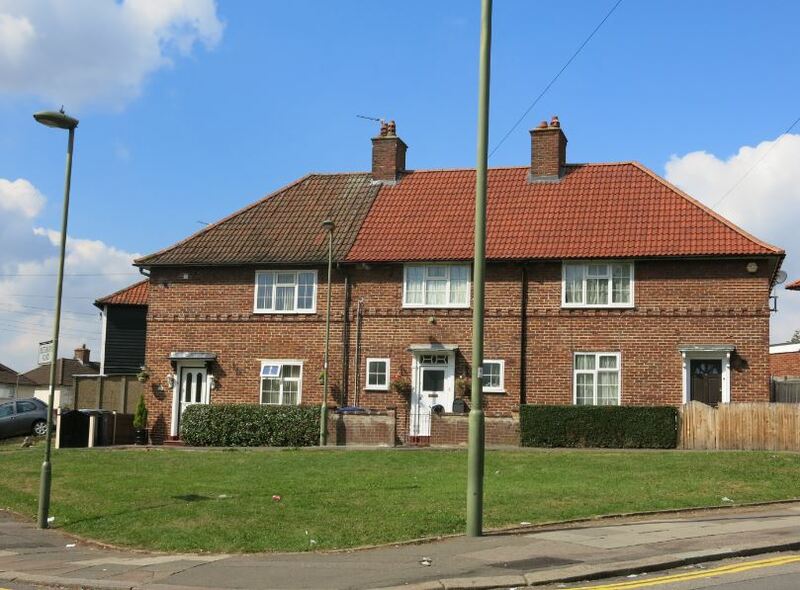 (2) Most were larger family homes, a mix of parlour and non-parlour; around 320 were flats. At that time there was nothing but bricks and mortar and acres of mud. The main thoroughfares were narrow lanes – little more that footpaths and cart-tracks in part. The first school opened in 1928, the large Watling Central School in 1931. 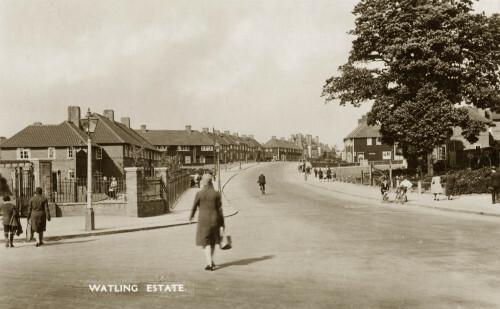 The main shopping parade on Watling Avenue was built in 1930 – a welcome relief to local housewives who had previously had to travel to Edgware for their groceries. Housing was the priority and the LCC’s architects were attentive to its design and detail, providing a range of Arts and Crafts touches across the Estate – in the predominant use of traditional brick and tile, timber window framing and doors, porches and canopies, and the deployment of dormers, eaves and bays adding visual interest and detail. 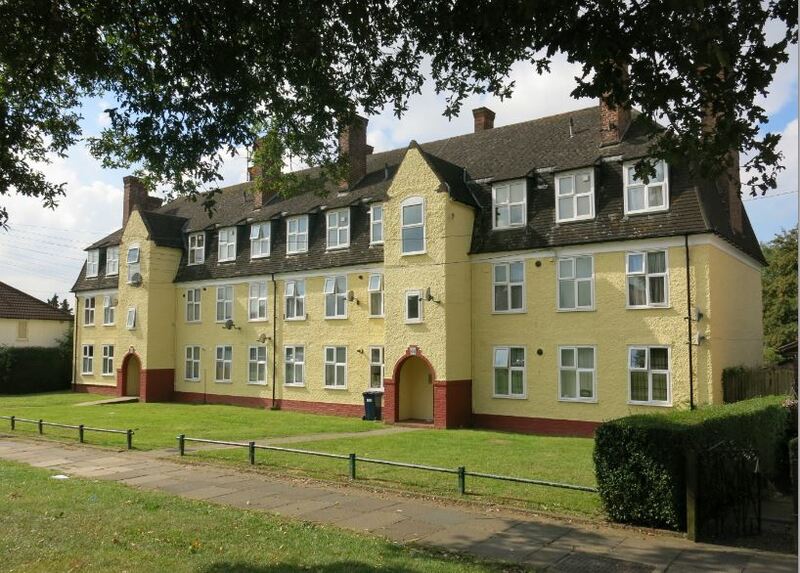 Compared to pre-war schemes such as the Tower Gardens Estate in Tottenham and the Old Oak Estate in Hammersmith or the early post-war Dover House Estate in Putney, Watling is plainer but it was good quality housing and a fine environment for Londoners escaping the inner city. It is the Estate’s overall layout which is more striking. Garden City ideals, albeit modified for scale and economy, were implemented in a range of the Estate’s features. Streets were designed to make the best use of the undulating site and offer vistas and views. So who were the ‘colonists’ of this fine new estate? Thanks to Ruth Durant’s 1937 survey we have a pretty good idea. One in five of the male heads of household were skilled workers, almost the same proportion worked in transport and almost one in ten were ‘blackcoated’ workers – clerical and administrative employees. Around 25 per cent were semi-skilled or unskilled labourers. This was then, typically for the new housing estates of the day, a relatively well-off though overwhelmingly working-class population. Over half the men earned between £3 and £4 a week in wages. Small families predominated and almost half the population was under 18. As Durant concluded, ‘only artisan families from London, in certain phases of their lives and possessing certain incomes, are eligible to live here’. It was this selection that accounted for ‘the comparatively well-to-do aspect of the Estate’ though looks could be deceiving. she used to pawn her washing every, every Monday. Her laundry, bed sheets, bed linen. And take it out again on Friday night…she used to cart it down to Harvey and Thompsons, who were the big pawnbrokers in Watling…they were the lifeblood of many people in Watling. Watling itself makes new demands upon the pockets of those who move there. Shopping is more expensive when the market is unfamiliar. The rents on the estates are a great financial burden, especially to those who formerly lived cheaply…The new house needs new linoleum, new curtains and even new furniture, and all is bought on hire purchase… Husbands have longer journeys to their work, are forced to eat more meals outside and to spend more on fares. The lowest rent on the Estate (for a two-room flat) was a little over 50p; for a five-room parlour home it stood at around £1.44. These were often twice the rents people had previously paid. In the old ‘mean street’, people were not tempted by example of their neighbours to acquire fresh impediments. At Watling, where more households with better incomes have settled, the wireless next door becomes an obligation to bring home a wireless. My husband thought it was terrible…’Godforsaken hole, miles away from anywhere’. My mother wasn’t too happy because in Marylebone we were just down the road from Selfridges but when you got to Watling it was just fields plus fields. All this helps explain why in its early years almost one in ten of households left the Estate annually, mostly to live more cheaply and closer to work or friends and family in central London though some left to buy their own homes nearby. For Durant, this turnover of population was one of the major reasons why Watling failed to be the type of community she wanted: ‘in the long run’, she concluded, ‘Watling is not much more than a huge hotel without a roof’. There was also the problem of demography. Watling didn’t house independent younger people with, typically, lower incomes; in other words, its own children. Still, the fact that ‘frequently Watling boys marry Watling girls’ – as she put it rather sweetly – and that both often found local employment did suggest that the population would stabilise. In next week’s post I’ll look more closely at the type of community insiders and outsiders wanted Watling to be and the type of community it actually was and I’ll question a few assumptions along the way. (3) Ruth Durant, Watling, A Survey of Life on a New Housing Estate (1939). Ruth Durant is better known, after her second marriage, as Ruth Glass. If you love London (in this case Middlesex), this really is a little treasure. Fascinating, there is an enormous amount of variety in those homes – much more than I had expected from the brief mentions the estate has in Robert Elms’ clothes related autobiography. Thanks for that reference – I’ll try to track it down myself. The chapter by Ann Hughes and Karen Hunt, ‘A culture transformed? Women’s lives in Wythenshawe in the 1930s’ in Davies and Fielding (eds), Workers’ Worlds. Cultures and Communities in Manchester and Salford, 1880-1939 is also good on this topic. Instead of visionary schemes like the Watling Estate we now have ‘regeneration’ of this less advantaged parts of the borough, which means developers given a free hand to clear away estates such as in West Hendon, close to the Watling area, move social tenants out – often out of borough – and build luxury accommodation in place of homes for the local community. It is effectively a form of ‘social cleansing’ and undoubtedly contributes to the scale of the wider and rapidly worsening housing crisis across the greater London area. Thanks for responding – though what you say makes depressing reading. The second paragraph rings true of what is happening across London. Great read, my mum moved to the Watling Estate (Homefield Road) aged 7 from West Kilburn in 1927. Our family lived there until 2002. I knew Eileen Dudley who lived at number 20. She regretted having to move away to look after her cousin. I was born in the front room of No. 57 Homefield Road 21 oct 1935 and lived there till I married in 1962. Apart from WW2 which I have a good memory of I had a great young life, the parks to play safely in Mill Hill swimming Pool was a wonderous place alas gone now Hendon Airdrome Spitfires and Hurricanes i can still hear the sound of their Merlin Engines, yes ,there is history of Watling estate or as some refered to it as Little Moscow because of its strong working class inhabitants wonderful people every one of them. Gardens were always looking tidy and privets cut everybody did their bit no airs and graces just really nice people that’s what I remember, No regrets being born and reared in Little Moscow. I endorse everything Stanley said. I too was born in 1935 in Marylebone before being re-housed in Cressingham Road just before WW11. Likewise, my grandparents, Mr & Mrs Pearman were moved to No. 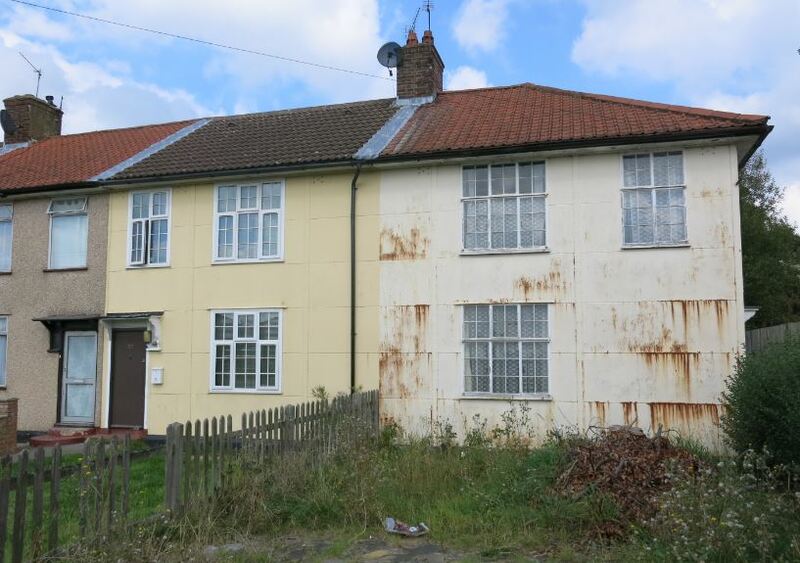 44 Homefield Road – opposite to Stanley’s house. My sisters, brother and I look back to our childhood in Burnt Oak with great fondness. It was like a large family, the adults “looked out” for the children and we respected the adults. It felt safe and friendly and we knew the meaning of sharing and fairness. 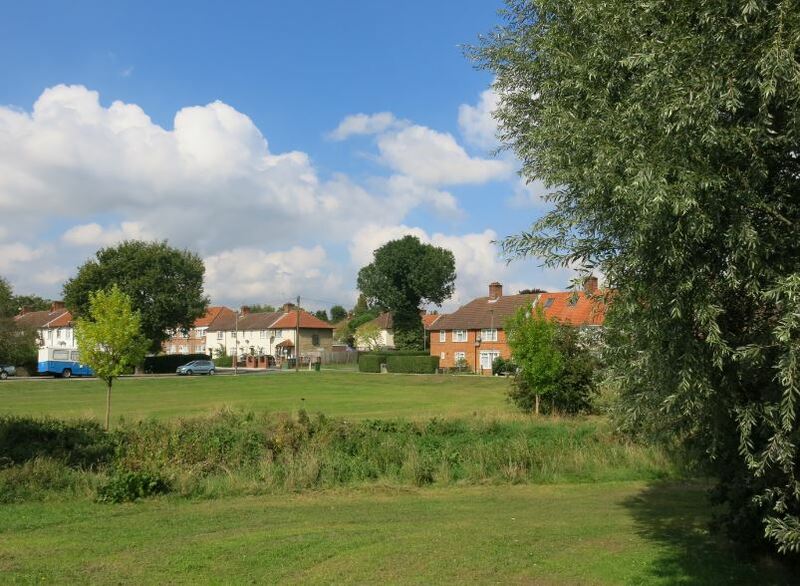 They say you should never go back, and I realise Burnt Oak now has changed, but I feel so pleased that I was there as a child in that lovely neighbourhood then – and Stanley I still cannot ride a bike!! Would anyone know where i can get some original architectural building plans for these houses? I live in dryfield road and have recently extended out the back to enlarge the kitchen and also to bring the bathroom downstairs creating extra space for bedrooms. Your best bet would be the London Metropolitan Archives – they hold a lot of the LCC’s original paperwork for the Watling Estate and you can do a search of their catalogue online. 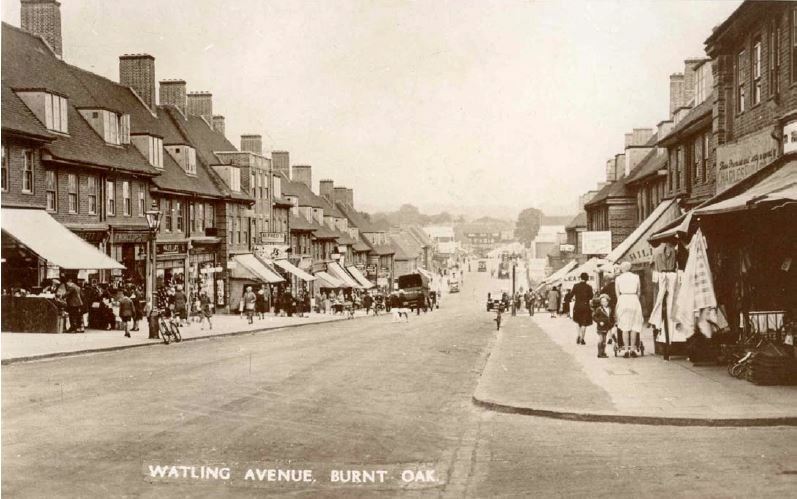 Both sets of my grandparents moved form London to Burnt Oak when the Watling Estate was first built. 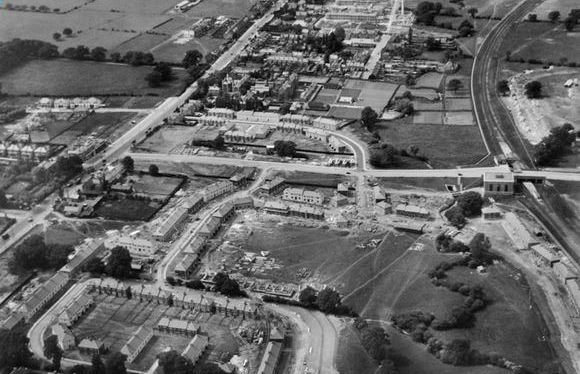 The Neeves lived at 2 Blessbury Road (the house on the left of your photo.) and the Moore family at 106 Orange Hill. Walter Moore married Dora Neeves in 1937 and my sister and I were born in Redhill Hospital in 1937 and 1938.My father was in Italy in WW2 and we lived in a flat with mother on Watling Avenue. These flats were bombed and we were billeted in Golders Green. Later we lived in a brick house at 251 Watling Avenue and my parents had two more children a son who died as a result of a cot death and my younger sister Maureen. 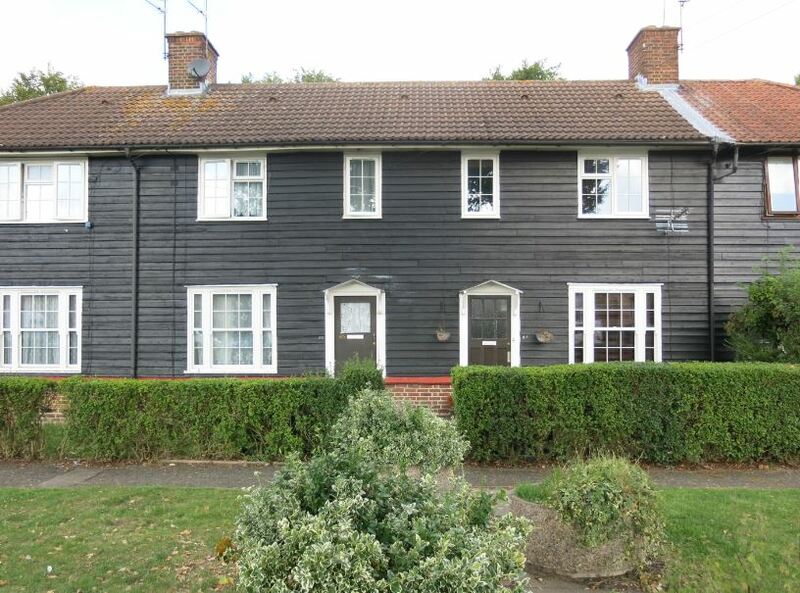 Needing more space we moved to 69 Fortescue Road into a black clapperboard house which backed onto the park.My sister Pat and I went to Goldbeaters School and both passed the 11+. Pat went to Copthall School, Reading Uni and became a Maths teacher and I went to Orange Hill Girls’ Grammar School and then to Uni and became a Science Teacher. We enjoyed the park,the Mill Hill swimming pool and especially the Brethen Church Woodcroft Hall and going to Girls’ Life Brigade at the Wesley Methodist Church. Our lives we very full and happy even though Pat and I had to deliver papers from the age of 11 until 18 in order to buy our school uniform although I must admit I was sometimes made to feel inferior as being a “kid from the council estate.” I moved from the estate when I married in 1969. Great article and photos, lived there in Cressingham Road and Fortescue Road from 1958 till 1970 when I got married. Worked for the LCC maintaining the shrubs, trees, grass and hedges and then in Watling Park for most of those years. One point not mentioned in the article (or have I missed it) is that the roads etc. were ‘named’ after the Abbots, Bishops and other prominent persons from the lands association with the Manors original owners both pre the Norman Conquest and after, that is, Westminster Abbey, who were holders of much of the Manor until the 1500’s and the Dissolution of the Monasteries. Thanks for your comment and glad the posts brought back some memories for you. No, I hadn’t mentioned the naming of the roads and streets so thank you for adding that additional detail. ..Did you know my Dad John Kealy..sometimes known as Sean who worked on the Council from about 1959 till his death in 1968 ? Hi, Certainly did, had a few drinks (or more) with John, and our Foreman Matt Hegarty, also in the ‘Watling Park’ gang was Steve Maroney, Joe and Dan Oneil etc, but it was John and Matt who I drank with, at the Key Club in Kenton and White Lion in Edgware. I remember John wife coming up to the Council Offices in Cool Oak Land to tell me John had passed! Semmes like age’s ago, hold on , it was, the 1960’s and early 70’s. My parents met at the youth club held in The Watling community centre, Orangehill road. Mum and her family lived in Dryfield road. Does anyone have photos from the youth club? Yes l do .l put one on Facebook recently. What was your Mum and Dads names. I all so met my husband at WatlingCentre Youth Club in 1956 approx. Replying to Cheryl Maw yes l have some photos of Watling Centre Youth Club, quite a few of us still meet once a year in July for a reunion, at least 8 couples still with original partners and we have all known each other for 62 years now. All from the Youth Club. My Mother moved to 34, Oldberry Road in about 1927, when she was 9 yrs old. My father lived in Milling Road, & they married in 1941. I was born at 34 Oldberry on 30 November 1946. I lived there for almost 18 years, until I joined the RAF in 1964. My old man stayed there until the 1970s, & failed to take advantage of the low-price offer to tenants to purchase their houses. Have you seen what those places are going for nowadays??!! I attended The Meads Primary School (Headmistress: Miss F.W. Cross) & then went to Orange Hill, 4 years after my brother, Phil. We accepted growing up on the Watling Estate because we knew no different.